Is Nissan planning to launch the Note e Power variant in India? The 2017 Nissan Note is a hatchback that is sold in various parts of the world. Launched in 2005, the current Note is in the second generation currently. The hatchback follows the company’s ‘V’ design theme and looks in-line with other models from the automaker. Based on the Nissan Invitation concept, the 2017 Note features a hybrid system which is unique to the market. Recently, a spy pic has surfaced that shows the model running on Indian roads. There are good chances that the 2017 Nissan Note e Power India debut would take place at the Auto Expo 2018. 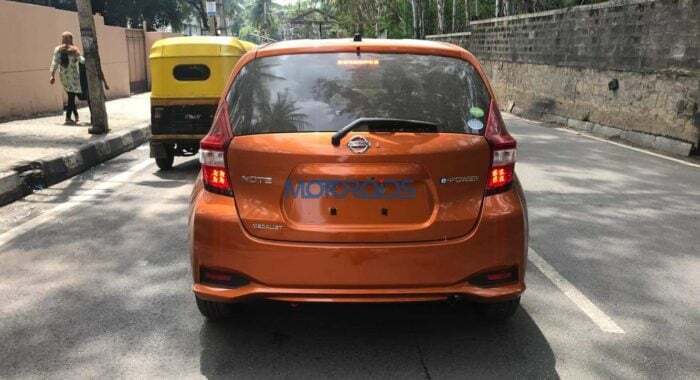 The Nissan Note has been spotted several times through the last couple of years but this is the first time the automaker has been spotted testing the e-Power variant. Considering that the officials didn’t even cover the vehicle or even de-badge it means the chance of it launching here are scarce. Perhaps Nissan is simply testing the equipment here and is evaluating to launch various parts of the vehicle as a part supplier. The Premium Corona Orange body paint was exclusively introduced on the e-Power variant of the Note this year and the spy shots showcase the same paint job. Another possibility is that of the company could be planning to showcase the e Power at the 2018 Auto Expo. The 2017 Nissan Note e-Power variant started sales earlier this year and the series-hybrid deploys a range extender type of technology on board. The Note e-Power features an EM57 electric motor along with a HR12DE 1.2-litre three-cylinder petrol engine. The difference being the propulsion system i.e. the front wheels derive only electric power while the petrol engine charges the battery as the car moves eliminating the need to plug-in the vehicle into a socket. As explained earlier, the 2017 Nissan Note is a series hybrid employing an EM57 motor that churns out 109 PS of power and 254 Nm of torque. The battery is charged by a three-cylinder 1.2-litre petrol engine with an output of 79 PS and 103 Nm of torque. The e-Power system being an electric driven one, the power surge is instantaneous and the driving experience is similar to that of an EV. 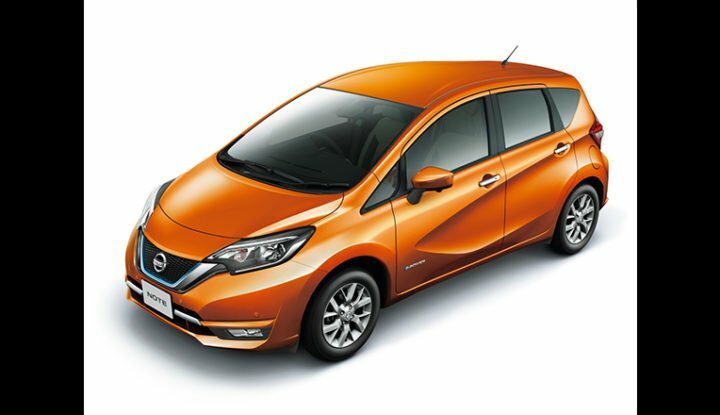 The 2017 Nissan Note e-Power packs a 1.5kWh battery that allows the consumer to enjoy zero-emission driving through town and as the battery drains below a certain level, the petrol engine kicks in providing the juice to the batteries and recharging them. 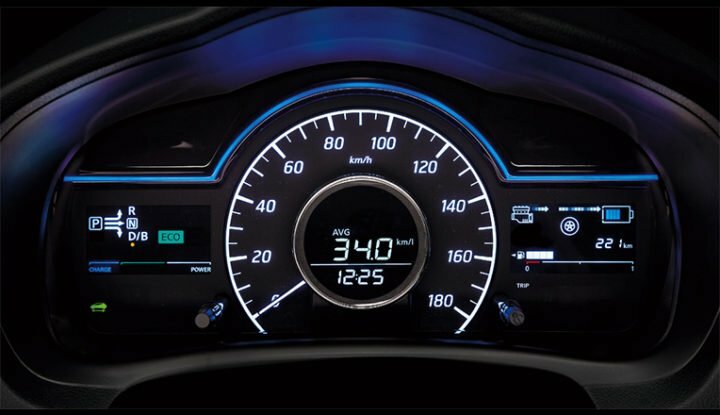 This system allows the Note e-Power to claim an average fuel consumption of 37.2 kmpl! Now that’s a number that excites us all. The chances of Nissan launching the Note e-Power are scarce but the company is evaluating to launch the Leaf and will be bringing the same to the 2018 Auto Expo.